CLEVER, this. 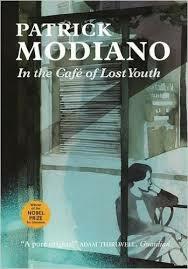 Modiano drills down into a euro-psyche of paranoia, of living in a world of secret policemen, of secrets themselves, a balance or imbalance of freedom and oppressions. The strange Captain keeps a diary of everyone who drinks in a bar because, he says, he wants to fix a moment in time, to bring order to the anarchy of the city, he is a chronicler of imbibers, for what reason, is the rub. Modiano further stamps the text with repeated and detailed street names almost like a guide book to Paris, a Paris that has now gone perhaps, as have other things. This is what you might call psyco-geography at its best. At the centre is Louki (not her real name, of course), a beautiful obsession along with her “dark-haired man in a suede jacket”. As with Modiano’s other books MacLehose Press has produced an edition that is fittingly elegant for a Nobel prize winner, the choice of paper, typography, white space all compliment Modiano’s succinct style. It is a nice thing to hold aswell as to read. This entry was posted in 101greatreads, Biography, fiction and tagged in the cafe of lost youth, maclehose press, paris, patrick modiano, psycho geography. Bookmark the permalink.